Singapore, a small island nation, offers a huge variety of experiences for holidaymakers of all kinds. This bustling cosmopolitan city has excellent shopping malls and fascinating museums; heritage trails and wildlife walks; a colourful nightlife and a huge choice of dining options. Much planning has been involved in maximising these attractions. Leading the way are the two integrated resorts of Resorts World Sentosa and Marina Bay Sands which offer the glitz and glamour of Las Vegas as well as all the excitement of theme park activities. Other massive projects are the 1.1 km boardwalk that runs along the coast and mangrove area of Chek Jawa, allowing nature lovers to get close to the rich plant and marine life, as well as ‘Gardens by the Bay’, three waterfront gardens that showcase horticulture and garden art. Singapore’s Botanic Gardens have developed into one of the world’s most respected with palms, cycads, bromeliads and a vast number of orchids. For sporting enthusiasts, there’s the recently introduced F1 Grand Prix, as well as all of the watersports you would expect around an island and some adventurous trekking in the national parks and wetlands. The wonderful array of cuisines from Peranakan to Chinese, Indian to Malay is proof of the collage of cultures that make up Singapore’s population. 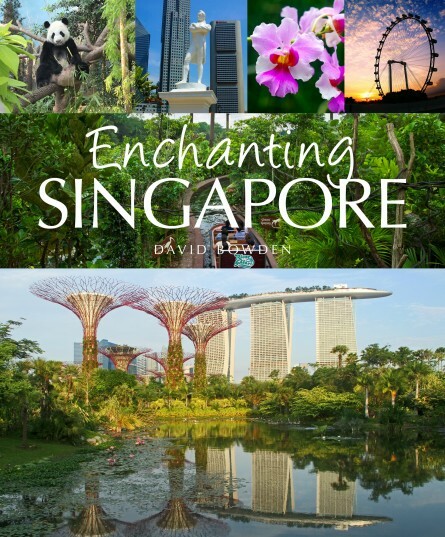 The Singaporeans have everything planned to make a visit exciting, entertaining and comfortable; Enchanting Singapore introduces all of the must-see places and events to help you make the most of your holiday time.